I am from the Blackfeet Nation and from the Penetuckah (sugar eater) and Yaparucah (root eater) bands of the Comanche Nation. I was raised a Comanche in Southwest, Oklahoma. My work is deeply embedded in both of these Plains traditions. I am a traditional doll maker, a jeweler, a regalia maker and a fashion designer. I studied fashion design in Dallas at the Fashion and Art Institute and worked for the renowned fashion icon Ralph Lauren. The exposure to the modern fashion world and my appetite for vogue, style, design and color, combined with my experiences derived from my travels as a World Champion dancer in the national powwow circuit, led me to the melding of traditional and contemporary in my regalia designs. Whether it be traditional powwow or ceremonial regalia or in their true traditional miniature form with my authentically dressed dolls, my eye for detail has helped me establish myself as a successful working Native artist. Additionally, I have gained notoriety by winning awards at some of the Nation’s largest Native art shows: of particular note was my collaborative 2010 Best of Show win at the Heard Museum Indian Market in Phoenix AZ. Similarly, my hand-made jewelry utilizes design elements that hail back to my cultural teachings. In both Southern and Northern Plains styles, my simple but elegant sterling silver pendants and still clearly reflect my proud heritage all the way to my hand stamp initials of JM which has been the cattle brand of Myers Ranch in Apache, Oklahoma since 1901 and is where my father Jim Myers resides today. Raised as an ‘Elder’s child’ my grandparents, Evelyn Blackbird Plumage and Elmer Winnerchy always encouraged and promoted my traditional talents and values. This left me with a strong sense of family, community and identity. These deep roots influence the traditional aesthetic of my work and my sense of obligation to my Plains people and to the future of Comanche People. 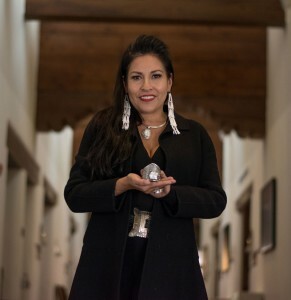 This is why in addition to my art, I proudly serve as Vice Chair of the Board for the Comanche National Museum.